An example of cyber-physical ensembles is a swarm of programmable ground robots and UAVs that perform a distributed surveillance mission - e.g., to achieve situation awareness during an emergency - by moving or flying to a suspicious location, collecting information, and returning to a base location in a formation that creates an effective sensing grid. This application also involves human-carried computing/communication devices such as smart phones that collect/report sensor data and inject users' interests into the system. Heterogeneous nodes have different capabilities: UAVs can y and generate an encoded video stream with their front- and bottom-facing cameras. Additional computing resources also enable UAVs to extract a snapshot from the encoded video and decode it into JPEG format. 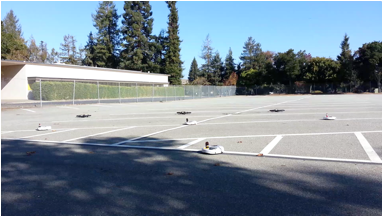 Robots can only move on the ground and decode the encoded snapshots from UAVs. The network is adaptive in the sense that it morphs in response to the users' needs. Fig. 1. User's interest is injected into the network at a location L0 around which the robots/UAVs are initially clustered randomly. A noise, recorded at a location L1, triggers the distributed mission. 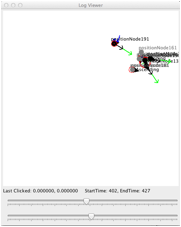 Figure 1 exemplifies the scenario in which a hybrid swarm moves/flies to a location to investigate a noise reported by an Android phone. The swarm takes a snapshot of the area and returns to the base location. In this scenario, perturbations from the environment (e.g., wind), delayed/incomplete knowledge due to network disruption, and resource contention cause uncertainty. Real-world actions must compensate for temporary network disconnections or failures. These actions can only indirectly control parameters, such as a robot's position, that can be observed by sensors (e.g., GPS). Therefore, a swarm should dynamically configure itself, optimize its resources, and provide robust information dissemination services that adapt to the users' interest in a specific topic. This interest can induce cyber-physical control (e.g., robot positioning, UAV trajectory/formation modifications) and trigger additional sensing (e.g., snapshot of an area). Goals (e.g., interests and controls) and facts (e.g., sensor readings and computational results) can arrive from the users and the environment at any time, and are opportunistically shared whenever connectivity exists. Programmable robots and UAVs compute their local solution based on local knowledge and exchange up-to-date information about the progress of their solution. These abilities enable a distributed and cooperative execution approach without the need for global coordination. 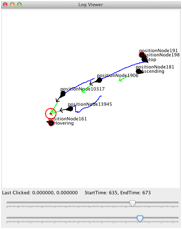 In a sample mission, the snapshot extracted from the encoded video stream (abstraction) may be directly sent to other nodes if the network supports it. If not, the decoded stream (computation) is sent to other nodes in the form of knowledge (communication). Each node can potentially engage in many abstractions, computations, and communications, which are classes of operations regarded as three dimensions of a distributed computing cube. The completion of a distributed proof accomplishes the mission. The solution assigns an approximate target region as a subgoal to a swarm's (macro-scale controls). The swarm moves or flies to locally realize the subgoal (micro-scale controls). The distributed reasoning continues to continuously recompute the local solutions and adjust macro-scale controls accordingly. To satisfy the subgoal of micro-scale controls, quantitative techniques such as virtual potential fields or artificial physics compute the movements of individual UAV/robots. For details, please refer to . 1. J-S. Choi, T. McCarthy, M. Kim, M-O. Stehr. 10th Int. Conf. Mobile and Ubiquitous Systems: Computing, Networking and Services (MOBIQUITOUS'13), Dec. 2013, Tokyo, Japan. AR.Drone 2.0, iRobot Create platforms, and various Android devices. 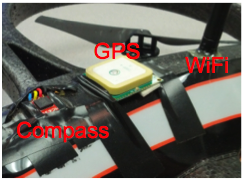 Heterogeneous Testbed: The AR.Drones and Creates were equipped with additional computing resources (Gumstix modules) and sensors (GPS and digital compass) shown below to increase their autonomy and improve capabilities such as localization in physical space. 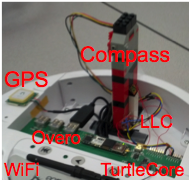 The Gumstix computer is also equipped with a WiFi antenna which provides communication via a peer-to-peer ad-hoc network. The testbed uses the Google Nexus S running CyanogenMod 7.2 with built-in digital compass, GPS, and camera as a standard Android device. As for the software side, the AR.Drones (firmware ver. 2.3.3) are controlled via WiFi, using a modified version of JavaDrone (ver. 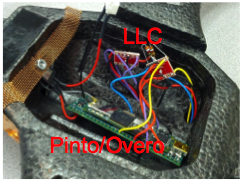 1.3)  for sending commands and interpreting information from the drone's onboard sensors and video cameras. JavaDrone was modified to support video reception from the AR.Drone 2.0 by extracting video frames from the stream and passing them directly to the framework rather than attempting to decode them. This encoded frame data can be decoded later when it is deemed necessary, possibly on another device with more available computing resources. The Creates are controlled via a direct serial port connection from the Gumstix using the cyber-API which supports sending movement and audio commands. 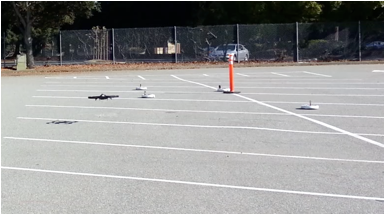 We tested an autonomous outdoor mission for distributed surveillance where a swarm of 3 AR.Drones, 4 iRobots, 2 Android phones in a 70m x 35m parking lot collects information about a target location. It is fully distributed and shows the core ideas of autonomous control of fractionated system. The localization is done without infrastructural support like a base station as a command/control post or external camera-based localization. First, a user�s interest injected as a goal. 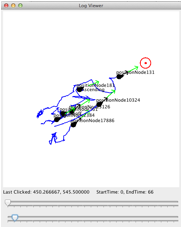 The other android app is used to report a sensor data to trigger the mission. The drones/robots are starting to move towards the target location, and take a picture then come back to the position where a user located.